The throne of God is a place of judgment and righteousness. The oppressed take refuge in the Lord and for His sake He maintains my right and cause (Psalm 9:1-10). I will praise thee, O Lord, with my whole heart; I will shew forth all thy marvellous works.2 I will be glad and rejoice in thee: I will sing praise to thy name, O thou most High.3 When mine enemies are turned back, they shall fall and perish at thy presence.4 For thou hast maintained my right and my cause; thou satest in the throne judging right.5 Thou hast rebuked the heathen, thou hast destroyed the wicked, thou hast put out their name for ever and ever.6 O thou enemy, destructions are come to a perpetual end: and thou hast destroyed cities; their memorial is perished with them.7 But the Lord shall endure for ever: he hath prepared his throne for judgment.8 And he shall judge the world in righteousness, he shall minister judgment to the people in uprightness.9 The Lord also will be a refuge for the oppressed, a refuge in times of trouble.10 And they that know thy name will put their trust in thee: for thou, Lord, hast not forsaken them that seek thee. Our Lord is the author and finisher of our faith who after enduring the cross not resides at the right hand of the throne of God(Hebrews 12:1,2).Jesus who is our high priest has made a way for us to come boldly to the throne of grace(Hebrews 4:12-16). 12 For the word of God is quick, and powerful, and sharper than any twoedged sword, piercing even to the dividing asunder of soul and spirit, and of the joints and marrow, and is a discerner of the thoughts and intents of the heart.13 Neither is there any creature that is not manifest in his sight: but all things are naked and opened unto the eyes of him with whom we have to do.14 Seeing then that we have a great high priest, that is passed into the heavens, Jesus the Son of God, let us hold fast our profession.15 For we have not an high priest which cannot be touched with the feeling of our infirmities; but was in all points tempted like as we are, yet without sin.16 Let us therefore come boldly unto the throne of grace, that we may obtain mercy, and find grace to help in time of need. 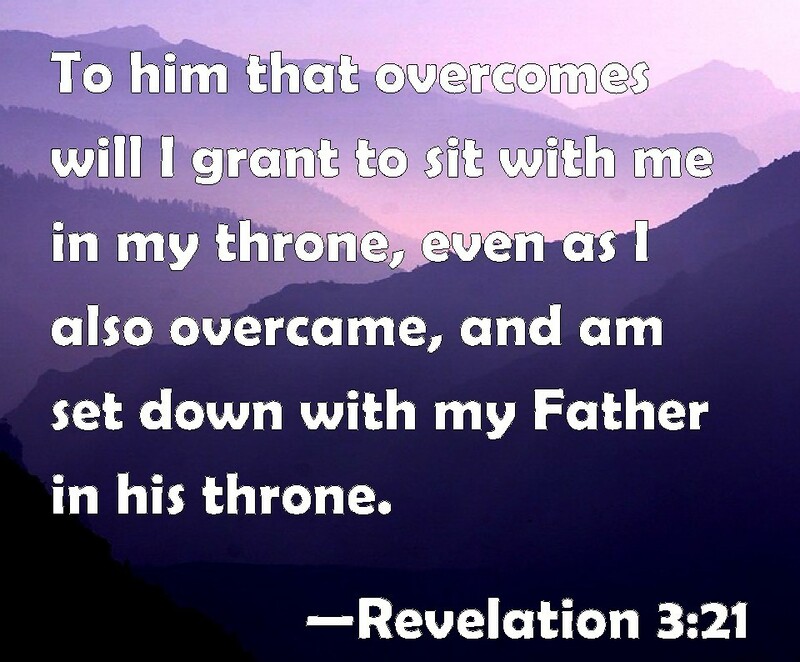 May we be over comers as our Lord has asked us to be so that we too may sit with Him in His throne! (Revelation 3:18-22). 18 I counsel thee to buy of me gold tried in the fire, that thou mayest be rich; and white raiment, that thou mayest be clothed, and that the shame of thy nakedness do not appear; and anoint thine eyes with eyesalve, that thou mayest see.19 As many as I love, I rebuke and chasten: be zealous therefore, and repent.20 Behold, I stand at the door, and knock: if any man hear my voice, and open the door, I will come in to him, and will sup with him, and he with me.21 To him that overcometh will I grant to sit with me in my throne, even as I also overcame, and am set down with my Father in his throne.22 He that hath an ear, let him hear what the Spirit saith unto the churches. ← Religion or faith and relationship?